Even though chickens are low maintenance in relation to livestock and pets in general, there are a number of things you need to consider before taking that big step. The site of the hen house and run. Are there any regulations or restrictions in place in keeping livestock in your area which have been set by the local council? What’s the purpose for keeping hens (pets, eggs, meat etc)? Are there many predators such as foxes common in your area and if so how are the hens to be protected? Who will look after them when you go away from home? Confirm with whoever you are collecting your hens from whether or not you need to bring along boxes to put your hens in. If you need to take a box you can either purchase a pet carrier (the expensive ones are plastic but the cheaper variety are made of strong cardboard) or you can just use an old cardboard box. 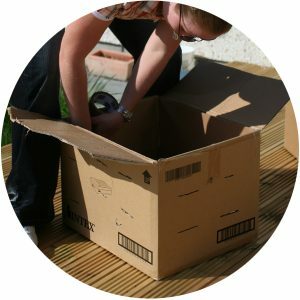 If you choose to use an old cardboard box make sure there’s enough ventilation and put a layer of newspaper and soft bedding in the bottom as this will soak up any droppings during the journey. It’s probably best to also reinforce the bottom with some extra packing tape to make sure that it will take the weight of your hens. It’s preferable that the journey from the breeder/seller to home is as short as possible to minimise the hens stress levels. 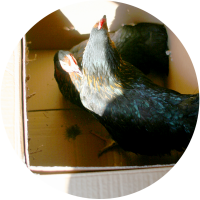 Once you arrive home carefully and quietly open the box in a closed coop and remove your hens from the box. Ensure that there’s enough food and water and leave your hens to settle in the closed coop. To get your hens to associate the coop as a place to roost at night and lay, it’s good practice to leave them locked up in the coop for anywhere between 4 hours to a day on the first day. After that you can open the coop and let them choose to explore their new pen/run in their own time. In my experience they don’t venture beyond the coop for a good couple of days and generally need coaxing out by placing the water and food just outside the coop door. After a few days they become more inquisitive and will begin to explore the run. This process will make everything easier for you and the hens and there shouldn’t be any need to gather them up to go into the coop at night, they will do this themselves when it begins to go dark. All you have to do then is secure the coop to keep them warm and protect them from any potential predators.